CHELINK 3.5mm Portable Car External Bluetooth Microphone Mic DVD Radio Laptop Stereo Player Head Unit with 3.5M Cable, is an optional external microphone for Pioneer, Kenwood, Alpine Audio System in-dash head-unit with built-in Bluetooth that feature a 3.5 mm microphone input. The microphone can be used with external Bluetooth interface module. 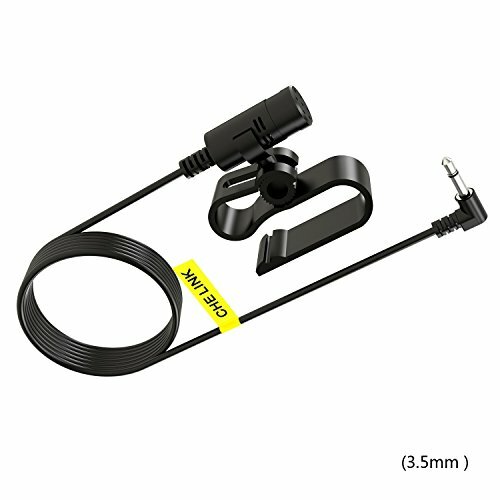 This 3.5 mm Car External Microphone Mic will provide you a better performance in noisy environments. * New revamped design gives you better quality sound during transmission, Highly improved the speech quality of hand free car kit communication system. * Compatible with: Pioneer, Kenwood, Sony, Alpine ect., car radio, (You can reference to the Detail Models on the Picture). Adopting electret condenser cartridge with high sensitivity , low impedance , anti-noise and ant jamming capability.